A deadly doctor returns, and celebrity wannabe Kenneth Horne gets some bona advice. With Kenneth Williams and Bill Pertwee. From May 1966. A deadly doctor returns, Rambling Syd Rumpo sings of courting, while celebrity wannabe Kenneth Horne gets some bona advice from Julian and Sandy. With Kenneth Williams, Hugh Paddick, Betty Marsden and Bill Pertwee. 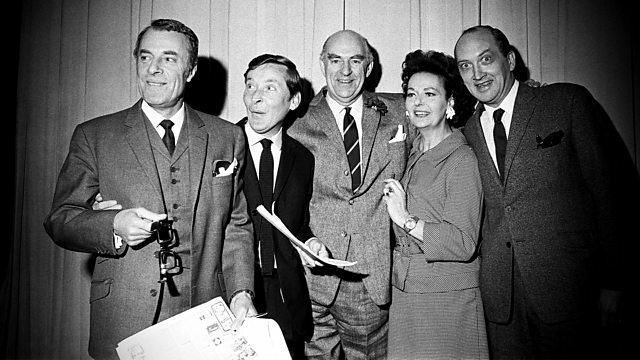 Round The Horne was born out of the demise of BBC radio comedy Beyond Our Ken, after the end of writer Eric Merriman's involvement. Using the same cast and producer, Barry Took and Marty Feldman were persuaded to write the scripts - which led to four series that ran between 1965 and 1968 - packed full of parodies, recurring characters, catchphrases and double-entendres. Music by Edwin Braden and the Hornblowers and The Fraser Hayes Four. First broadcast on the BBC Light Programme in May 1966.